My richly illustrated guide to understanding Dreamweaver 8's style tools will get you started right. A Beginner's Guide: Writing CSS with Dreamweaver 8 is a 32 page e-book, crammed with specific tips and hints to help you understand Dreamweaver's tools and how to use them. Plus a listing of resources and additional sources for help. Are you confused? Need help? Are you confused about how to attach a style sheet? Do you get lost when you try to start a new stylesheet? Are you completely in the dark when it comes to advanced selectors? If the answer to any of these questions is yes, then this e-book is for you. I've worked with beginners for years. I know exactly the kinds of mistakes beginners make with the Dreamweaver CSS tools. I see the same misunderstandings among beginners again and again. This e-book addresses the needs that I've learned from experience will strike beginners. Don't let frustration and confusion keep you from using CSS and becoming the masterful Dreamweaver user you need to become. This beginnner's guide will make Dreamweaver's style tools yours to command. You get the value of all my years of experience with beginning users for only $4.79. That's quite a bargain. What if you have an older version of Dreamweaver? 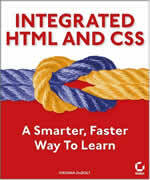 The basic way the CSS tools work in Dreamweaver has remained the same for many versions. Reading this guide will help you understand older versions, too. There may be a few features you don't have in older versions of Dreamweaver, but the interface works as it's described in this e-book. Buy now. 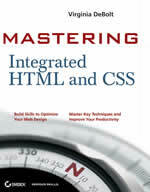 Pay through PayPal and download A Beginner's Guide: Writing CSS with Dreamweaver 8 immediately. Don't waste another minute of frustration figuring out how the software works. You are buying a print-ready PDF document. Are you a teacher? This book can be reproduced for educational use. Please refer to the copyright and license information included in the book for complete details. Do you have accessibility issues with PDF documents? Contact me using the link at the top of this page and tell me how I can provide the e-book in a format you can access.